Summon: Draw a card. If it costs 7 or more, reduce its cost by 1. Thieves Guild Recruit is a common Agility creature card. It is part of the Core Set. In addition to the card's availability in the Core Set, three copies are included in the Black Marsh Smugglers theme deck, three copies in the Brynjolf's Heist theme deck, three copies in the Hlaalu Schemes theme deck, three copies in the Paarthurnax's Roar theme deck, and one copy in the Dagoth's Might theme deck. "By bark and birth, this is interesting." "I will cut your purse, and your throat." "My scales move in shadow." "You will die where you stand." The card's summon ability applies the Got the Loot card effect. 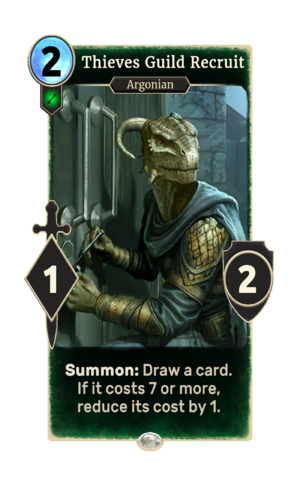 The card is named for the Thieves Guild, which first appeared in Daggerfall, and later reappeared in Morrowind, Oblivion, Skyrim, and ESO. The card's summon ability was originally "Draw a card. If it costs 7 or more, reduce its cost by 2. ", until this was changed in Patch 1.69.0. This page was last modified on 15 February 2019, at 14:09.